Shepherd, originally uploaded by navandale. 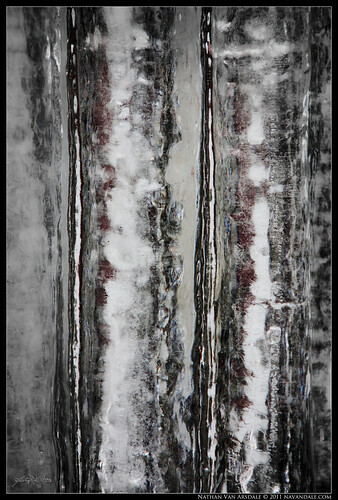 This image is an "abstract" photo I took of some icicles. I love discovering transcendental features of the everyday or mundane. I chose this image for this blog post because I took it when I got home from the story below. Something as simple and abundant as water can become ignored as white noise, as is the case with many things in life... but as is the case with most everything, when examined under the meditative, inquisitive, photographic lens, new layers and emotions emerge. Photo specs, f5.6 1/200 ISO 250. Contrast adjustments in Camera RAW. I quite enjoy when I can witness the Universe working through/with people. In my own practice, I have felt/perceived extreme connection and universal oneness, but usually through meditation. But on this day, I wasn't trying... I was just enjoying myself, skiing as I have done nearly every day this year at Sierra at Tahoe. On this day, I was placed in the exact right place, and at the exact right time. Though anyone in my place would have done the exact same thing, I am humbled to have been put in the situation to save a man's life. It was a very snowy powder day, and I was deep in trees on a run that I never ski--I had been making laps on one of my favorite routes, but when I got off the lift this time, I found myself for some reason turning down the main run. I turned off of the main run into the woods, only occasionally coming upon other tracks. It was great powder skiing, but I felt the urge to stop, so I did. Ten feet away in a tree-well I saw a sliver of black sticking out of the snow, just about 3 inches of the edge of a ski. I figured I would retrieve the ski and bring it to Lost and Found. Then I noticed the tip of a ski pole mixed in with the hanging, snow-covered branches of the tree. At this point I stopped thinking. "HEY, ARE YOU OK!!!" I shouted at the realization that someone was likely buried in that tree well. Three more times I shouted, "HEY, ARE YOU OK?!?!?" Then I saw the ski move a little with a kick, confirming that someone was indeed buried, and that they were at least conscious. I started to move closer. I should point out that this year the Sierra's have received more snow than they have in at least 15 years (according to local friends). Maneuvering on mountainous terrain in chest-deep snow is NOT easy, even with awesome powder skis like what I have (K2 Kung Fujas ). And, in order to dig this guy out, I would have to unclip from my skis. His ski was locked by the tree's trunk and branches on the uphill side, and his head was on the downhill side under an unknown amount of snow. As I moved closer, I continued shouting, and to my surprise and delight he replied, "I'm OK!" "Keep breathing." I said, "Are you injured?" "I think I'm ok, he said, but I'm stuck and can't breath. I can't move my legs." He kicked his leg a little, showing how pinned he was. "Don't try to move." I shouted. "I'm going to get you out of there... but first I need to dig down to you." I stomped out a platform to take off my skis close to the tree well. Once I unclipped, I sank down to about my waist, and used my poles and skis to keep myself supported. "HEY, I'm going to unclip your skis, OK?" I shouted. I had no idea how long he'd been buried. But I knew that every second of a claustrophobic situation like that feels like an eternity. I unclipped his ski, and continued talking to him... if anything just to let him know I was there. His other ski was still on his other foot, buried about 2 feet below his showing ski. I reached through the snow, and once I found his release lever, I unclipped his other boot. The sense of relief was palpable, but he was still really stuck. He was still buried in a cage of frozen branches with his head downhill. I told him I was going to have to dig around the tree to where his head was. So, with snow up to my chest I forced my way around the tree, half-digging, half-bull-dozing. I kept talking to him, letting him know I was getting closer. I made it around the tree to where I heard his voice, and started digging. About 3 feet down, and I still don't see his head. I found his arm, and grabbed his hand. It was more for reassurance than for anything, but he pulled at it as though he was grasping at straws. He was really stuck! A snowboarder appeared about 20 feet away and shouted asking if everything was ok. I told him to go tell Ski Patrol, that there were no apparent injuries, but to come quickly. I gave him landmark details that would let Ski Patrol find us easily. After a minute of hesitation, I told him the quicker the better, and he left. Then... Finally. I felt his goggles, and then quickly went to clear the snow over his face. He was face up! I'm so happy he didn't drown! His goggles were loaded with snow. "Try to take slow breaths and don't move," I cautioned, "because were not done yet." I had basically borrowed a hole to his head, leaving walls of delicate snow all around. Any movement would surely send snow avalanching back onto his face. "My name's Nathan, what's yours?" "Jim" he replied gratefully, "and thank you Nathan." "Jim, I've still got a bit of digging I have to do... some snow might fall back in your face. Don't panic if that happens. I know it's been a dark and hard to breath. Just stay calm, and I'll get you out of here in a sec." A little snow did indeed fall and re-cover his face... but it was easily brushed away. The snow around his helmet was nearly cemented, which made it impossible for him to move his head, and difficult for me to dig him out. I also wanted to be careful not to aggravate any potentially damaged bones. After another few seconds, though, I had enough of his upper body dug out that he could move and wriggle to a manageable position. Taking the snow-filled goggles off his face he sighed, "OOh that's a scary movie." and then paused for a moment of reflection. We tried in vain to find his other pole, all the while chatting. He thanked me numerous times by the time I gave up searching for his pole, telling him, "Well Jim, I think we should chalk this pole up as a sacrifice to the snow Gods." This whole ordeal took about 20 minutes from the time I first noticed his ski. I asked him how long he'd been down there before I arrived, although I know it probably felt like forever. He estimated about 2 minutes. With the rate of snowfall we had, another two minutes and his ski may have been completely covered. Aside from the snowboarder who stopped when he saw me digging, only 2 other people skied by within 30 feet. I am sharing this story, because I am so grateful for the way angels, the universe, God, the Source, biochemical-electromagnetic-gravitational forces, etc. steer us from time to time. I don't think that what I did was heroic, or deserving of any accolades, but simply the necessary thing to do in the given circumstance. I am sharing this story because I hope it inspires you in some way.